The writer, a resident of Llandudno, regularly uses public transport to visit his favourite haunts in North Wales. He sometimes takes the Arriva S2 through bus at 9:50 am from Llandudno that arrives Pen y Pass (shown here) at 11:10 am. Pen y Pass stands at the head of the Llanberis Pass and is the location of a large car park, a Youth Hostel (formerly the Gorphwysfa Hotel) and a popular cafe. It is of course the starting point for several walking routes to the summit of Snowdon. Pen y Pass is the hub of the Sherpa bus network and there are good bus services to and from Llanberis, Beddgelert, Rhyd Ddu, Waunfawr, Porthmadog, Capel Curig, Ogwen, Bethesda, Betws y Coed and Llanrwst. 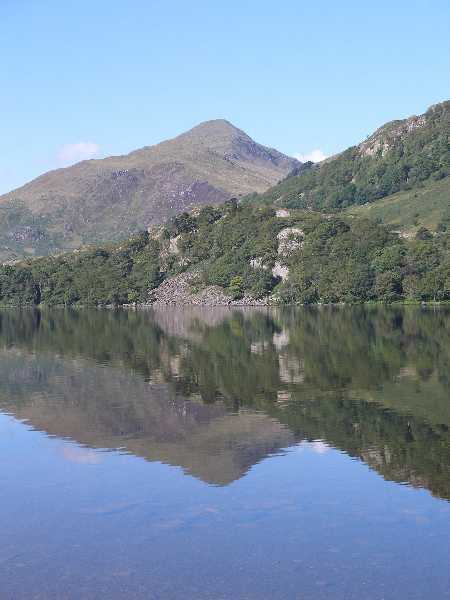 Take the Miners track via Llyn Teyrn, Llyn Llydaw and Glaslyn, an easy walk as far as the lakes, and the only way in which to see these hidden Snowdonian lakes and also the Snowdon copper mine locations as well as superb views of the Snowdon Horseshoe. The walk is about a mile each way. On the way back the Pen y Pass Centre with the Cwmffynnon bowl high above and behind, seen from the Snowdon Miners Track. 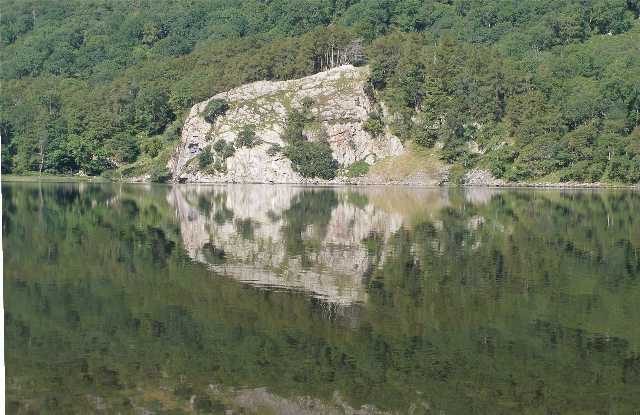 Cymffynon and its lake are hidden away behind the ridge but can be reached by a footpath to the left of the Youth Hostel. In the jottings below the writer refers only to places easily reachable by the Sherpa bus service. In the opposite direction, the descent from Pen-y-Pass to Pen y Gwryd is a short but steep downhill walk with the most magnificent views of Nant Cyndyd leading to the Nant Gwynant Pass, see below (served by Sherpa buses), the pass descends from Pen y Gwryd to Beddgelert. In the valley foreground is the Cwm Dyli hydro electric power station. 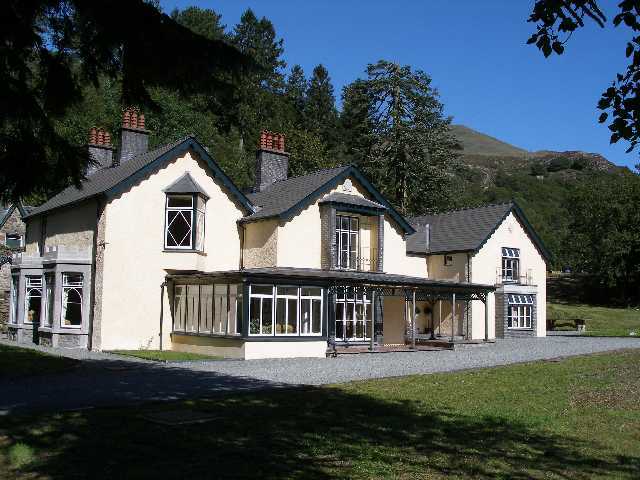 Pen y Gwryd is noted for its ancient hotel built on the site of a Roman Marching Camp. It has frequently been visited by climbers who left their mark during training expeditions and notably by Sir John Hunt and the members of the successful Everest expedition of 1953. This photo below was taken from the Sherpa bus stop. Here can be had a very good pub lunch. Here too are to be found the signatures of the successful climbers of Everest, in June 1953 – Sir John Hunt (leader), Sir Edmund Hilary and Sherpa Tensing – not in any conventional and dusty visitors book – rather, with others, written on the ceiling of the climber’s bar for all to look up to! More recent Himalayan climbers including Chris Bonnington have also added their mark. Behind the hotel are the steep scree covered slopes of Cwmffynnon. This little lake at Penygwrd Llyn Lockwood is named after the 1920's hotellier who created it as a fish pond and to give his visitors a view of a lake. It is, with the hidden Llyn Cwmffynnon the source of the Afon Gwryd that flows through Nant Gwryd and Dyffryn Mymbyr, the sheep farm made famous in "I Bought a Mountain" by Thomas Firbank, to Capel Curig. 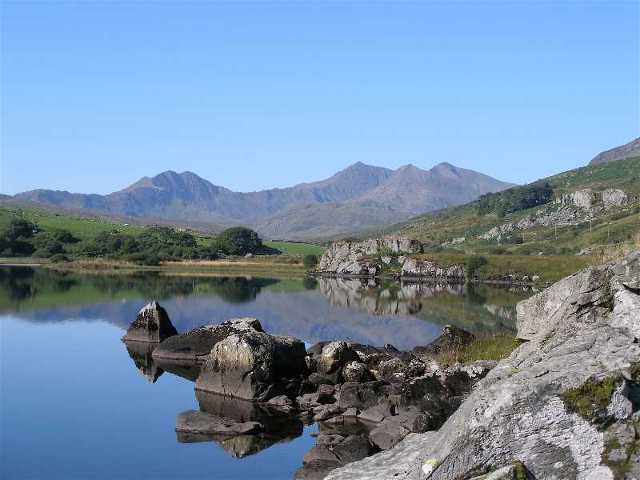 Just above Capel Curig is Llyn Mymbyr with this famous view of the Snowdon Horseshoe. Here also at Capel Curig is an ancient church Eglwys Santes Julitta now in the care of a local charitable trust. In pre-Norman times the dedication of this church was probably to Saint Curig, a Welsh Bishop of the 6th Century. Later the name became Latinised to Cyriacus and identified with Saint Cyricus who with his mother Saint Julitta was martyred at Tarsus c304 AD. Probably known by the end of the 12th century as Saints Cyricus and Julitta, it later became known just as Saint Julitta. The peak of Yr Aran reflected in the still waters of Llyn Gwynant. is described as a restored miniature Victorian estate.